This policy applies to Continental UK Group Holdings Limited (Company Number 00566118) and the below named companies within its group only. The above companies will be referred to as the West Drayton Sub-Group. 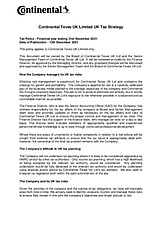 This document will be owned by the Board of Continental Tyre Group Limited (CTG Ltd) and the Senior Management Team of CTG Ltd and the Senior Management Team of CTG Ltd. It will be reviewed annually by the Finance & IT Director, for approval by the Managing Director, and any proposed changes will be discussed and approved by the Senior Management Team and the Board of CTG Ltd. Effective risk management is paramount for the West Drayton sub-Group and underpins the strategy for continued growth and profitability. The West Drayton sub-Group’s appetite for risk is a carefully calibrated part of the business model aligned to the strategic and Continental AG Group corporate objectives. The aim is not to avoid or eliminate risk entirely, but to strictly manage the West Drayton sub-Group’s exposure to risk wherever possible in a balanced and as controllable manner as possible. The Finance Director, who is also the SAO for the sub-Group, has ultimate responsibility for the tax affairs of the companies at Board and Senior Management team level and provides updates to them as necessary on the tax affairs and risks of the West Drayton sub-Group to ensure the proper control and management of tax risks. The Finance Director also has the support of the Financial Controller and the wider finance team who manage tax risks on a day to day basis. The finance team includes members of appropriately qualified and experienced personnel whose knowledge is up to date through continued professional development. The West Drayton sub-Group will not undertake tax planning where it is likely to be considered aggressive by HMRC and/or by other tax authorities. Only routine tax planning, which has a high likelihood of being accepted by the relevant tax authority, would be considered. Any planning undertaken would be fully disclosed to the relevant tax authority and would be undertaken using analysis and/or advice by the West Drayton sub-Group’s tax advisers. We also seek to interpret tax legislation both within the spirit and intention of the law. Given the activities of the company and the volume of tax obligations, tax risks will inevitably arise from time to time. We actively seek to identify, evaluate, monitor and manage these risks to ensure they remain in line with the company’s objectives and broad attitude to risk. We are committed to comply with all UK tax legislation. Compliance for us means paying the correct amount of tax at the correct time, disclosing all relevant information to the tax authorities and claiming reliefs and incentives where applicable. The West Drayton Sub-Group will comply with all relevant legal disclosure and approval requirements and all information will be clearly presented to HMRC as appropriate. We engage with HMRC with honesty and integrity and in an open and transparent manner. We actively engage with our CRM on a real time basis on any material tax points to the group and any areas of uncertainty on interpreting tax law are discussed with them in advance. 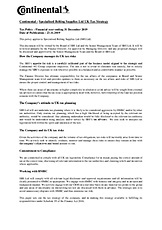 The strategic aim is to avoid unnecessary disputes with HMRC and thus minimise tax risk. This paper sets out the tax strategy of the company, and in making this strategy available is fulfilling its responsibilities under part 2 of Schedule 19 of the Finance Act 2016.